Meg Houston Maker is an active food, wine, and culture writer. She travels extensively across the globe to meet and taste with producers, hear their stories, and see first-hand what links them to their land. Her journalism has won praise from Eric Asimov of the New York Times, Andrew Sullivan of The Daily Beast, Maria Popova of Brain Pickings, BuzzFeed, TheKitchn, Wine Business Monthly, The Browser, and other commentators. 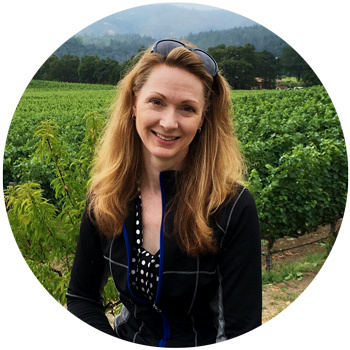 Meg regularly contributes feature writing and criticism to consumer and trade publications, including The Art of Eating, SOMM Journal, eBay, Snooth, Serious Eats, Palate Press, Edible Communities, Nomacorc, and Alimentum: The Literature of Food. Meg travels throughout Europe and North and South America to conduct research and taste with wine and food producers. Also an exacting editor, she has guided the launch of three wine publications and mentored scores of writers, seasoned and new. She is former editor at large for Grape Collective and former executive editor and columnist for Palate Press. View freelance clips and writing awards and accolades. Terroir Review is Meg’s own award-winning publication dedicated to nature, culture, food, and place. The writing features articles, winemaker profiles, and interviews chronicling Meg’s extensive research travel, plus reviews cataloging ongoing tasting. Launched in 2008 as Maker’s Table, the site was rechristened in January 2018 with a new name and purpose: to tackle food’s most important questions, to stimulate both appetite and mind. Meg is dedicated to the creative nonfiction form, focusing her essay writing on narratives about the intersection of nature and culture. She completed her Master’s in Liberal Studies / Creative Writing at Dartmouth College, with concentration courses in narrative nonfiction, personal essay, creative nonfiction, play writing, oral history, and selected topics in comparative literature. Her book-length creative nonfiction manuscript, Making it Home, won the Thesis Excellence Award for Creative Writing. View a sampling of Meg’s essays. Meg Houston Maker is available for freelance writing and editorial assignments.